If you're a dame like me who likes to get her drink on (that's me -- guilty as charged), but are also looking to cut calories while still having an enjoyable grown-up beverage (also me), Teresa Marie Howes' SkinnyTinis is a great answer for your needs. Before diving into a series of manageable recipes, SkinnyTinis provides a good introduction into the art of mixology. With charts to show and explain the calorie-per-ounce content of common drinks and mixers, it gives good base knowledge to explain why many of our favorite drinks have so many calories in them. Featuring a blend of original recipes and remakes of famous drinks, each one comes in at about 140 calories. When you figure the average cocktail in a bar has more than 300 calories in it, this is a steal. The amount of calories becomes more comparable to a glass of wine or a 12-ounce craft beer. In my experience, lighter beers range closer to the 100-calorie mark, but you also miss out on a lot of the flavor of these other drinks. And that is OK sometimes, but it is great to have other options if you're into a more flavorful variety of drinks. I am a big fan of vodka, but until I saw this book, I would typically default to a vodka soda (with a twist of lime) any time I go to the bar for cocktails to save on the calories. Howes also provides a short list of items that are always good to have on hand should the desire to make a drink arise. Though some of the recipes may call for other specialty items, you are in pretty good shape if you keep this manageable list in stock. All of the recipes feature a few items in it, meaning three to five for the most part. That is a nice change of pace, when you consider that a lot of favorite bar drinks are more complicated than that. Paired with lovely photos, this portion of the book is asthetically pleasing and easy to follow with skinny tidbits provided along the way. Candy Apple Martini - Not only does it sound delicious, but I'm sure it'll quench that craving I get every fall to consume only apple- or pumpkin-flavored products. Cabo Sunset - A vodka-based tropical drink. I am a vodka girl, and most tropical drinks seem to have rum, so this recipe was music to my belly. The Gingersnap - As a fan of Moscow Mules, I am super eager to give this one a shot, because it looks easier to make and apparently tastes like a gingersnap cookie. Pink Panther - It's always good to have a pink cocktail on your list of recipes to indulge in. They're perfect for holidays like Valentine's Day or girly nights out. Skinny Chocolate Martini - This puppy has 148 calories compared to your usual 453. And it is chocolate. You better believe I'll be making these drinks while I take my online bartending course. (Yes, I'm taking online bartending school thanks to an impulse Living Social buy.) Thanks to this book, I can do my homework in a way that will not force me to pack on the pounds I am working so hard to lose. 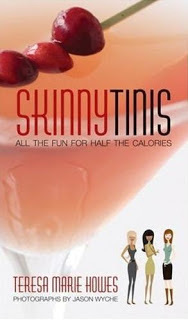 Check back tomorrow for my interview with Teresa Marie Howes, creator of SkinnyTinis. Teresa Marie Howes is a health enthusiast, expert skinny mixologist, avid runner and published author. Backed with a formal education with degrees in both nutrition and business and over a decade of professional experience consulting in the weight loss industry, she certainly knows the “right” things to do when it comes to living a healthy lifestyle. She is also well versed in the challenges that an active social and travel calendar can infringe on ones best efforts to do these “right” things. As it turns out, what’s “right” isn’t always “realistic” and that’s where her personal experience plays a key role. She has battled out the conflict of “right” and “realistic” in the bars, on the road and on vacation for 15+ years – and now in her mid-thirties and at a weight less than she weighed in high school, she’s feeling pretty confident in her strategies and is eager to share them! Take a look at the other stops on Teresa's tour here. This is an excellent guide! darcy: who wore it best?